Open Gym time is available for pick-up play on Monday, Wednesday, and Friday 12:00 PM - 1:00 PM. Please call the front desk before coming to verify court availability (919) 474-2400. Rate: $5 per person. Weekend dates occasionally available, all participants must have appropriate daily wristband to be on court. Ball-Use Policy: You can use one of our recreational balls by checking in at the main information desk. A driver’s license or set of car keys must be submitted to the front desk while using the ball. If ball is being used by a minor without license or keys, a $10 deposit will be required. To request a Rental Court, please submit the online Form for a prompt reply. Basketball players of all Ages may benefit from the use of the "Shooting Gun" which rebounds shots and passes back to you greatly increasing repetition and efficient utilization of your time. It is possible to get up over 400 shots in a 30 minute time period! 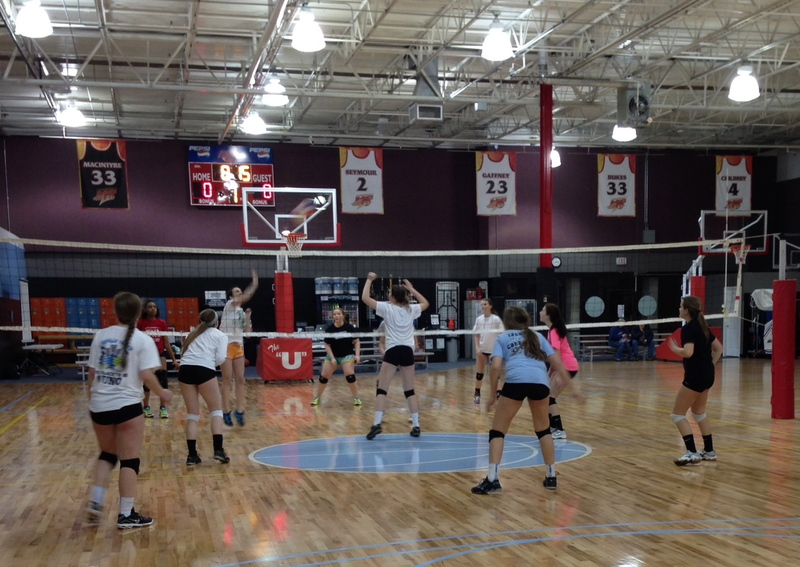 Two Volleyball Regulation Courts and One Practice Court are available for rental.